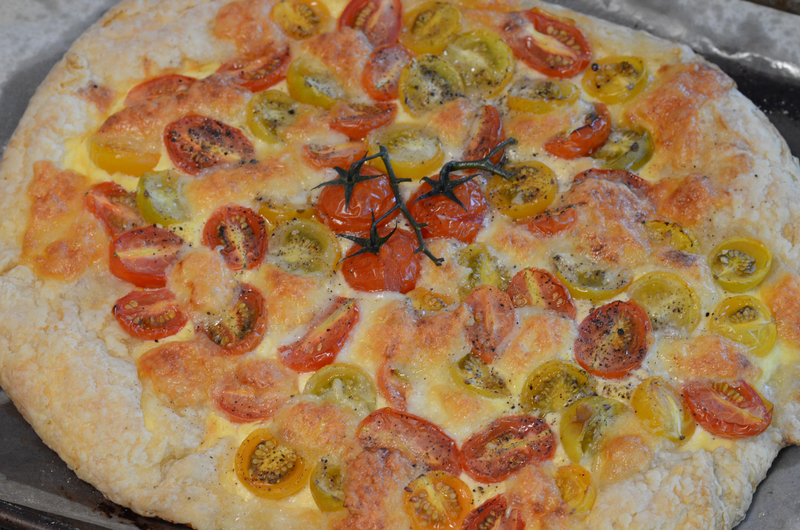 I became enamored with this tomato tart idea several years ago. It seems to me to be an interesting substitute for the carbohydrate in a meal when you want to make something special, but also slightly rustic. It works as beautifully with a picnic lunch of pate and salad as it does with a dinner of grilled lamb, which is what we had it with last weekend. You have to work ahead a little to prepare the puff pastry, but if you have a batch of it in the freezer, it is pretty simple to roll it out, put on the toppings, and bake it off. I should mention that leftover tomato tart is fabulous for breakfast the next day. Preheat the oven to 400 degrees F. Line 2 baking trays with parchment paper. Roll the pastry out to about 4mm thick, keeping as circular a shape as you can. Put the pastry on the prepared baking trays and refrigerate for 10 minutes. Prick all over with a fork. Put the ricotta and egg in a bowl and mix well to combine. Spread the mixture over both pieces of pastry, leaving a 1 inch border. Fold in the borders to form a rim. Bake for 12 minutes. Remove from the oven and arrange the tomatoes, cut side up, over the tarts. Drizzle with a little oil, then bake for a further 10 minutes. Nestle the torn mozzarella in among the tomatoes, and bake for a further 2 minutes or until starting to melt and slightly browned. Once removed from the oven, sprinkle with the chopped herbs, sea salt, and freshly ground pepper.